This entry was posted on Tuesday, June 28th, 2016 at 3:22 pm. I recently read and reviewed Carly Kade’s first novel, In The Reins. 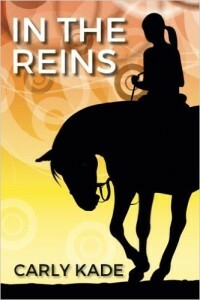 A smashing hit of a debut novel, In The Reins is equestrian romance with a cowboy twist at its finest! Carly was kind enough to take a few minutes from her busy day to answer some of my questions – please read below to learn a bit more about a new favorite author (and friend)! 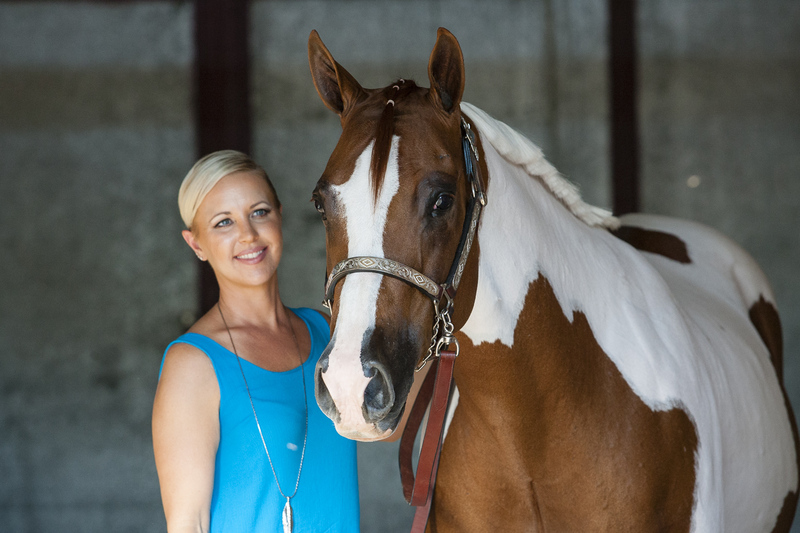 And pictured below is Carly with her Paint mare, Sissy – aren’t they a gorgeous pair? (Photo ©melanie-elise.com). Tell us a little about your life as an equestrian. When I’m not writing or reading, I’m riding my horse. I am a member of the American Paint Horse Association and love competitively showing my Paint Horse, Sissy. I recently moved to Arizona, so I’ve just started to explore all the amazing horse show options that my new home has to offer. I feel fortunate because it seems like there’s a horse event (almost) every weekend here, and I board my horse at a picture perfect ranch nestled between mountain ranges. It’s the kind of place I dreamed about as a girl! The classes I usually show in are showmanship, western horsemanship, and western pleasure. Recently, I’ve been back in my English saddle and am thinking about showing in some hunt seat classes again! When did you realize you wanted to be a writer of equestrian fiction? I always enjoyed creative writing and was recognized as a young author, but I never set out to be a writer. It just kind of happened when McKennon Kelly showed up one day in a poem I wrote in my journal! When I started really writing In The Reins, I knew I wanted readers to feel like they were falling for the leading man as they turned the pages of my story. Generating that kind of feeling was my goal – what I wanted to create for readers – so In The Reins naturally became a romance novel. I know that I sure wouldn’t be able to resist reading about a handsome cowboy who knows his way around horses, so I wrote about what I knew … horses and cowgirl culture. Are the main characters in In The Reins(Devon, McKennon, JD, Sophia) based on real people, or are they completely fictional? Sometimes I wish they were real people, but, alas, the characters from In The Reins are a product of my imagination. The leading man, McKennon Kelly, is all the things I think women wish men could be, then sprinkled with a little bit of what I imagined a cowboy who can make the eight on the back of a raging bull would be like. The leading lady, Devon Brooke, represents all the mixed emotions that make up a woman: strength, independence, uncertainty, desire to find love, and that little bit of neurosis I think a woman can harbor when her fantasies don’t exactly match up with reality. Devon’s judgment certainly becomes impaired over a cute guy in cowboy boots! Sophia is the gentle, intuitive, motherly figure I think every human wishes they had in their lives, and JD is the driven, never-give-up type that lightens the mood and provides a good giggle every now and then. When I released In The Reins, I made video shorts to introduce each character in the book. You can meet the characters from In The Reins on my YouTube channel here. Do you have a favorite character from In The Reins? I think JD is mine – not sure I could have resisted him if I were Devon! I love that JD is your favorite 😉 I was hoping it would be difficult for readers to choose between JD and McKennon. I think their combination is the perfect storm when it comes to hot cowboys! I love all of the characters from In The Reins, but if I have to choose, I’d say my favorite character is McKennon Kelly. McKennon comes from the part of me that is in love with love. My cowgirl heart was a flutter as I created him. I am proud of McKennon Kelly. I hope he sparks a smile across readers’ lips as they turn the pages of In The Reins. He certainly continues to makes me smile as I write the sequel. Where does In The Reinstake place? I may have missed it – sorry if I did! For some reason, I assumed Texas. My journey writing In The Reins spanned four states! I started thinking about the book concept in New York, actually began writing it in Michigan, finished the manuscript in Texas, and then made the final edits and published the novel in Arizona. Since I’ve lived in so many places as a horse lover, (and while writing the book), I was intentionally vague when it came to the whereabouts of Green Briar. Devon did drive south that day but to where I didn’t indicate. It was important to me to not intrude on my readers’ imaginations. I want the characters and Green Briar to live in the minds of readers, so I’ve been careful not to intrude on how the characters or the place might look in a reader’s imagination. As the sequel is coming to be though, I think readers may get more geographic clarity! What’s next for the Green Briar gang? I can’t wait to see what happens between Devon and McKennon! My spurs are sooo jingling over the sequel! In The Reins was just the beginning! McKennon and Devon’s story definitely continues. Let’s just say readers will get to take a deep dive into McKennon’s past and learn about what made him the man he is in In The Reins. I hope to have the follow up out in late 2016 or early 2017. Tell us a little about your overall writing process. What advice would you give to an aspiring author? I definitely get the most writing done in my home office during my morning writing sessions. My husband is my human alarm clock! I wouldn’t be able to do it without him because I am not a morning person. We get up every morning at 5:30 a.m. and start our day by walking our dogs, and then return home to meditate for about 15 minutes. Taking in the beautiful Arizona landscape and then quieting my mind really prepares me for creativity! Then I pour my first cup of coffee and settle into my office for my morning writing session. My morning routine is when my creativity is most alive. No matter where I am, I love to listen to music when I write … all kinds of music … what I listen to depends on my mood. Some days it’s classical, sometimes it’s a movie soundtrack, other days it’s jazz or classic rock, and a lot of the time it is country. I often write about what I’m listening to on my blog. The biggest challenge is finding the time. My favorite Stephen King quote is, “The scariest moment is always just before you start.” I always worry I won’t have anything to write, but then I sit and make the time and the story magically starts writing itself through me. That is why the morning routine is so important. It forces me to make the time to sit and write … no excuses. My advice to an aspiring author is make the time to write! I recommend setting a goal like writing for 60 minutes uninterrupted or not stopping until you’ve reached a thousand words. Just start … that’s all you have to do. Also, I make a rule to “touch” my story every day even if it is just reading part of it or writing a few words. As long as I stay engaged with what I’m writing, the world I’m creating is never far from reach. It’s when I’ve been away from my words for extended periods of time that I find it hardest to get back to writing it, so I try not to let that happen. I highly recommend reading On Writing: A Memoir of the Craft, by Stephen King. I loved the book as a reader and a writer. I discovered this book through its high ratings in the writing community. I enjoyed it from beginning to end. This is a book for anyone who writes, anyone who aspires to write, anyone interested in knowing a little more about the life of an author or someone interested in knowing more about Stephen King as he gives a brief history of what led him to where he is now. It was fascinating! Now some just for fun questions! What’s your favorite riding discipline? Why? I love riding western. I like the history behind it. The cowgirlness of it. I like the attire. I like the idea of western pleasure – its origin is rooted in the fact that the horse is supposed to be a pleasure to ride. Do you have a favorite breed of horse? I am prone to the stock types (AQHA, APHA, PtHA, PHBA). I love the color breeds. I had a Palomino as a girl, and now I have a Paint. I really love how color breeds stand out in a show pen and each Paint is uniquely patterned. No two are colored the same! Favorite horse book, author, movie, etc.? Flicka starring Tim McGraw. I went to see this at the theater with my dad. It is a great movie about the fragile bond between a father and his daughter. Hildalgo – This movie is like Indiana Jones for horse lovers! The Man From Snowy River – This is a classic for me! I have the framed movie poster from our small town theater, (my mom asked for it), hanging in my home today. My family loved it that much. The Return to Snowy River – The sequel is just as good as the original and produced by Disney! The Black Stallion – A childhood favorite that never seems out of date to me. I loved all the Walter Farley books so much. It is so hard to choose, and I have so many more! For more of my favs check out my “Best Horse Movies” blog post here. Well, I just finished your book, Where the Bluegrass Grows, and loved it! Ahem, waiting on your sequel (smile). Now, I am currently reading the Red Rock Ranch series by fellow equestrian author Brittney Joy. Her books are also western-themed and are proving to be excellent summer reads! And finally, what’s one thing you’d like your readers to know about you? My inspiration comes from going places where cowgirl boots are the norm and welcomed. Places that are a little rough around the edges, (and that’s a good thing). Places where people know how to fix things when they are broken. Places where people still hold a book in two hands. Places where people don’t mind if they get a little dirty. Places where people are willing to take a real roll in the hay or race across a field on horseback. It’s the open places I love. I wrote In The Reins from that place … for the cowgirl in all of us who loves horses, an engaging romance, and a sultry cowboy as the leading man. Before I am an author, I am a reader. I want my readers to feel transported when they read my books. I write for all readers like me … horse crazy, book crazy, cowboy crazy. This book is for my readers. I know who you are – you are me. Looking for more Carly and In The Reins? Connect with her on Twitter, Facebook, on YouTube, or on Instagram @carlykadecreative!